The weather turned nippy, so I made a quick trip to the garden. 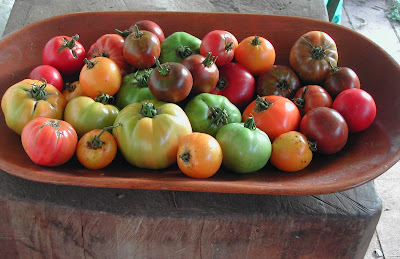 We fought tomato blight this year, so we did not have the most beautiful tomatoes. 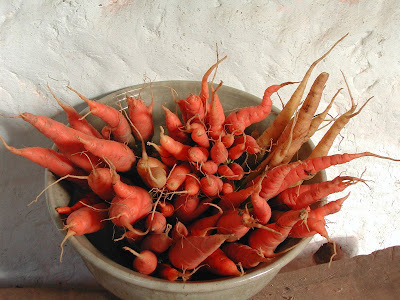 The carrots were a bit late, but they were nice and sweet. I was so motivated by the bounty, I made tomato sandwiches for dinner! I am already thinking about what to plant next year!! 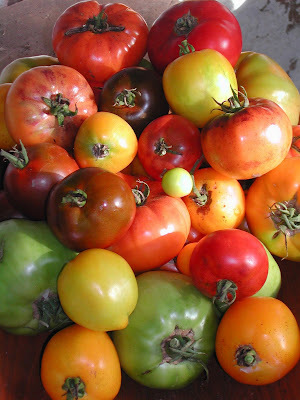 Did all those different colored tomatoes come off the same plant, or does each plant yield one color of tomatoes? I've been wondering when I see heirloom tomatoes at the grocery. What will you do with all that produce? Do you freeze, can, cook into yummy things and freeze, or what? This year we planted about a dozen varieties. Due to the blight, many of them did poorly. Some of the better producers this year were: Green Zebra, Dr. Wyche's Yellow, Orange Fleshed Purple Smuge, Paul Robeson, Yellow Pear, Black Krim and Bonny Best. I have several people in D.C. who particpated in a CSA, so nothing was wasted.